Fake swords apparently started being made around the Kamakura period. 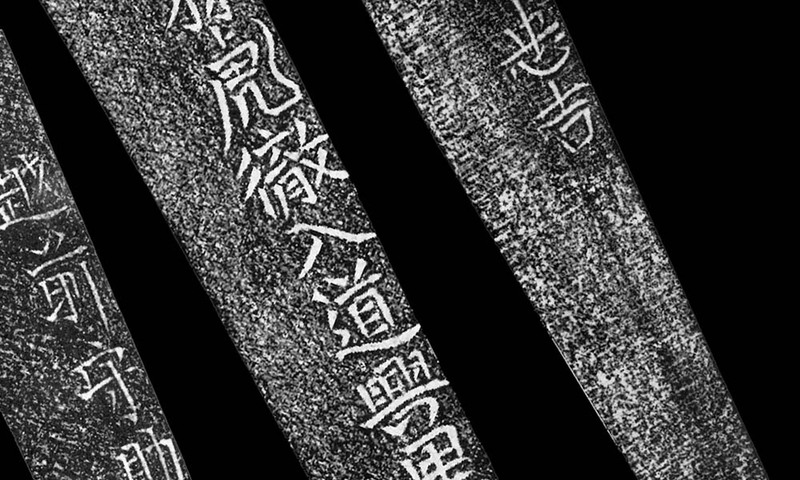 In the Muromachi period there was already a “certificate of authenticity” which included an inscription on the tang of the words and a description of the blade. 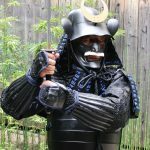 In the Edo period fake swords “developed” further, and all sorts of fakes were produced. The first type is to create the sword in a similar shape then inscribe the name to make it look like the real thing, then sell it. Some of the fakes were actually made better than the real sword! Next are swords with gold inscriptions in them. Gold inscriptions began in the Momoyama period (late 16 to early 17 Century) when the Hon’ami household carried out authentications. For long swords whose inscriptions on the tang had been cut out by Suriage , they would put in the new inscription in gold. For swords that had no inscriptions(Mumei swords), they would put in vermilion inscriptions. This was only allowed by the Hon’ami household, and this is why there are many fake swords with gold or vermilion color inscriptions. 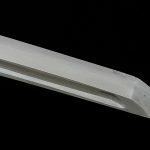 The most common pattern is that swords without name inscriptions or with inscriptions that are scarcely known, the inscription will be removed and an inscription of fame be put in over it. In order to identify these fake swords, it is necessary to look at the product quality as well as understand the historical period, style, and school of sword-making, but the best way to learn this skill is to look at real swords displayed in museums and study them in depth. You will never know the value of real swords if you keep looking at fake ones. Most sword traders and collectors have felt regret at buying swords that ended up being fake, and they spend hours studying so they can avoid repeating the mistake. 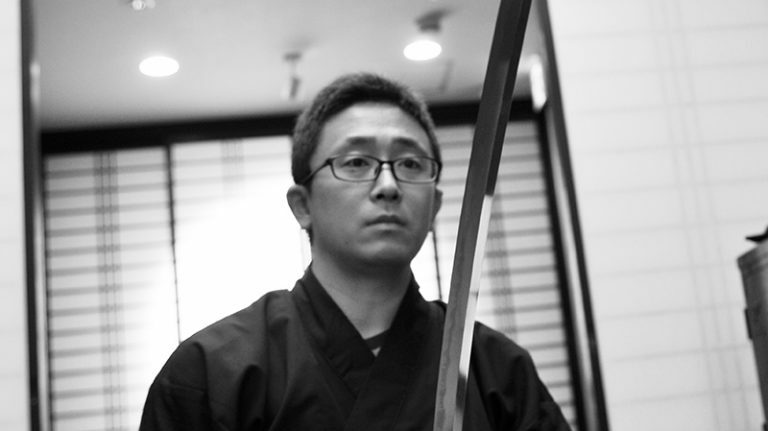 To nurture an eye for the real sword, one must spend much time look at the real sword before studying fakes. 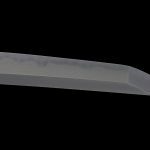 As for the parts of the sword, it is divided into the blade and the tang, but the two parts are one continuous piece together. The tang, Nakago, usually is written with the Chinese character “root”, but it is often also written with characters meaning “center”. That is how important it is. For the elegance of the old style long swords, the tang needed to match that elegance too. It would be strange if it had a thick tang like they did in the late Edo period. The blade and the tang must match, and the tang is often the easier part in the authentication process. The tang is judged for its shape and form, its rasp, its rust, and the inscription. Especially regarding the rust, some swords have a manmade “rust” produced by special chemicals. The only way one can tell the difference between natural rust and man-made rust is to see and touch many real swords. It is also imperative to study the history of swords and acquire accurate knowledge. 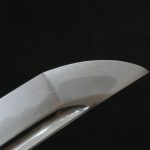 There are good resources like the “sword production time line”, but nothing beats looking at real swords. “If there is a certificate of authentication and we can trust it, right?” one may ask. 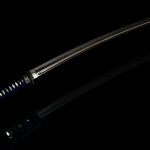 There are certain agencies like the Society of Preservation of Japanese Art Swords and The Society of Japanese Sword Preservation that issue certificates, but often the certificates themselves are fake. Even if the sword you want to buy has a certificate, instead of taking it at face value you could check with the issuing agency about the certificate number and the written contents before purchasing it. The notes of authentication on the box and the sheath are also areas where people are led to think they are real, but do not forget that it is far easier to mass produce fake boxes and sheaths than fake swords. Of course there are real swords accompanied with real boxes and sheaths, but it is best not to take the authentication of the box or sheath into consideration when judging the authenticity of the sword. If anyone tries to convince you that the sword is real because of its box or sheath, that is a sign to be careful. Again, one cannot develop an eye for judging what is real or fake without seeing real swords. Long ago when training artwork traders, the apprentice will only be shown good artworks as part of his training. Those with a great eye in the past used to say that if you always see good things you will immediately notice the bad, but if you always see bad things you will lose the ability to see the good. I believe this applies to today too. 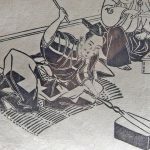 NEXT POST Next post: Reflections on the Shinai’s History – Is the Shinai just a bamboo sword or is there more to it?